Following our introduction and teardown of Time Capsule, we were deluged with questions from readers about the product and how it works. Here's what we've found, along with some discoveries reported by readers. Andy M asks: "Can the TC unit be used as a 'hard wired' external drive either by connection with USB or Ethernet? In this hard wired mode can the TC be used to read and write data like a normal external hard drive? The 'hard wire' connection may be needed to speed up large file transfer or in the event that the AirPort (WiFi) connection is unavailable for some reason." There's no way to put Time Capsule into anything like FireWire Target Mode, but if you want to connect to the drive faster than wireless networking will allow, attaching a computer directly to its Gigabit Ethernet port will provide very fast connectivity approaching the same speeds as a directly attached USB attached disk. The unit can also be opened and the drive can also be removed and attached directly via SATA, but this is not trivial nor convenient to do. A Look Inside Apple's New Time Capsule shows how to open the unit up to access the drive. "Can the TC be used as a normal external hard drive to store data? In other words can I manually drag files and folders to and from the TC (when it is connected wirelessly or when 'hard wired')." "If one has the TC close to ones main computer, would you recommend keeping it permanently connected by USB or Ethernet cable to improve the data transfer rate. In my case the wireless capability would only be needed for other computers or laptops in the house." Gigabit Ethernet is indeed much faster than WiFi, yes. "Can you tell me how loud Time Capsule is? Our network hub is in the kids room and I want to make sure that the fan to cool the disk is not loud and noisy." Time Capsule is virtually silent. I can only hear the drive running if I have the unit in contact with my ear. It runs slightly warmer than Apple TV. It has a 30 watt power adapter, meaning that it doesn't use that much electricity though the drive is running all the time. "Can the TC be partitioned like a normal external hard drive? If so how big a partition should one allow for Time Machine backup? I guess this also raised the question: Is it necessary or desirable to partition large capacity hard drives?" The Time Capsule software does not provide any support for partitioning the drive, but has no problem dealing with partitions on the drive. That means you'd have to remove the drive and partition it yourself. Many readers asked about partitioning, but for most users, there isn't really any good reason to partition the disk, as it would only create artificial barriers to using the drive. "I read through many of the posts since Time Capsule was announced and never could I find anyone who was able to or knew if you could partition the internal hard drive in Time Capsule. Therefore, when I received the beauty on my door this morning, I opened Time Capsule, connected the drive directly to my mac via USB SATA Hard Drive Cables and took a look at what was on the drive. There is a partition for the Apple Airport Settings, a partition for the Apple Airport Swap File, and the third partition where all your data goes. So first thing I did was use disk utility to make a backup of the current configuration in case my drive were to ever fail. Then I proceeded to resize the DATA partition to suite my needs of my 3 macs.. (630GB) and left the rest for use as a NAS Space (300GB). I put the drive back into Time Capsule turned it on and crossed my fingers. Just as I thought, it worked. When using Time Capsule install disk it shows two partitions: Data & Data_2 (below)." David W., in Boston asks: "Does the Time Machine support partitioning into two separate volumes with separate password protection (to facilitate two users mounting their own independently password-protected volumes on the drive)?" No, even if you add your own partitions to the internal drive, there is no mechanism for using different passwords to secure different volumes. This also applies to adding external USB drives; there is only one password for all the shared drives, and no provision for setting up complex folder permissions. This is the same as disk sharing on AirPort Extreme. Jose B. similarly asks: "I would to know if I can set shared folders on the Time Capsule Hard Disk, with restricted permissions (some users can read, some users can r&W, etc).... Would this be possible with Time Capsule?" Yes, in addition to setting up a single password for all users, both Time Capsule and AirPort Extreme allow you to define a list of users, and assign each read only or full read and write permissions. However, there is no more granular controls to set up drop box (write only) permissions or to define different permissions on different volumes, files, folders or drives. 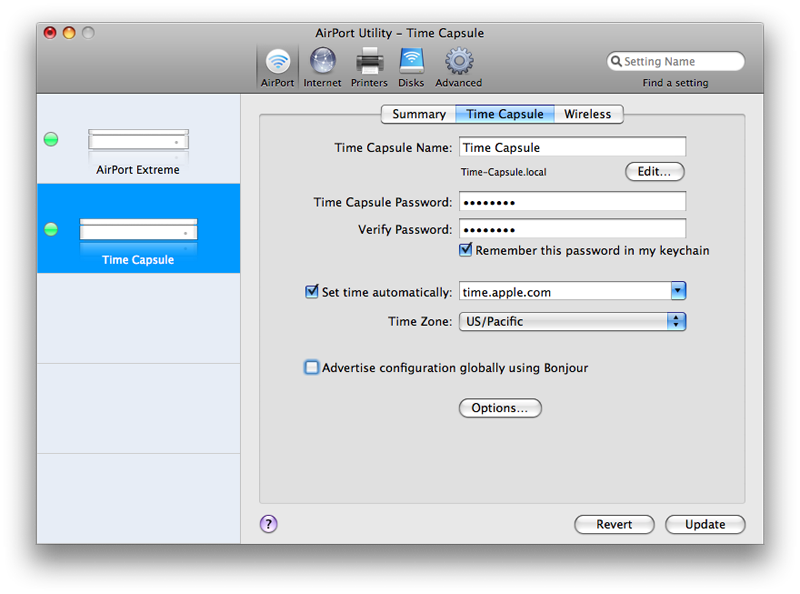 The only significant difference in how Time Capsule works compared to AirPort Extreme is that the new unit supports being used by Time Machine for backups. AirPort Extreme does not currently support being used as a backup target by Time Machine, although it can be hacked to bypass the restriction. Officially supported use with Time Machine would apparently require a firmware update to the Extreme, and Apple is being coyly quiet about whether or not this is in the works. Theo K asks: "Can you control how much space Time Machine uses of your Time Capsule, so you could say I would like to use 200Gb for Time Machine, and 300 Gb for file sharing in general. I have heard that Time Machine uses all your available space on your drive, so basically you could end up with 500gb of Time Machine backups, and be left with no room for file sharing."" Time Machine will indeed eventually use up all the disk space available, and there isn't any way to set it to only use a specific amount of disk space. Attaching an external drive would provide a natural barrier to separate the disk used by Time Machine and the disks used for general file sharing. Apple has recommended using Time Machine on a volume that is only used for sharing. Manually partitioning the drive would be another option, but users can also just occasionally check their drive to make sure they haven't lost 500GB to backups. Lance Gilbert asks: "Can the Time Capsule be set up to use its own internal drive as a backup and then switch over to the external drive once the internal drive is full? In other words, can both the internal and external drive be combined for use as backup drives?" There is no automatic fall over system, but users can switch Time Machine to point to the new external drive after filling up the internal volume were that to occur, leaving the backups on the internal disk intact as an archive and available for later retrieval. Time Machine can return to a previously used volume to restore files. David K. asks: "Please include how/if one can transfer existing Time Machine backup files from another hard drive to Time Capsule." If the existing backups were made to a local drive, this wouldn't be practical, as local and network drives use different file structures to save Time Machine data. Once a drive has been used with Time Machine, it's best to either retain it as an archive, or choose to wipe the drive for reuse. The files on it are not really designed to be portable. Mr L. in the UK asks: "Early reports suggest the Time Capsule uses a sparse 'expanding' partition to store Time Machine backups. Theoretically, this would continue to expand until the disk is full. Could you see if it is possible to 'limit' how much of the drive that Time Machine can use up, by creating a read/write disk image (say, 250gb) and placing that onto the Time Capsule drive?" Partitioning the disk or using an additional external USB drive would probably be better ways to accomplish the same thing. Trying to force Time Machine to use a rigid sparse image constraint may result in lost backups, which would not be a good thing. "Can the drive be mounted at-will, and used as a regular network-attached drive for drag-and-drop storage?" "Can the drive be accessed over the internet, e.g. 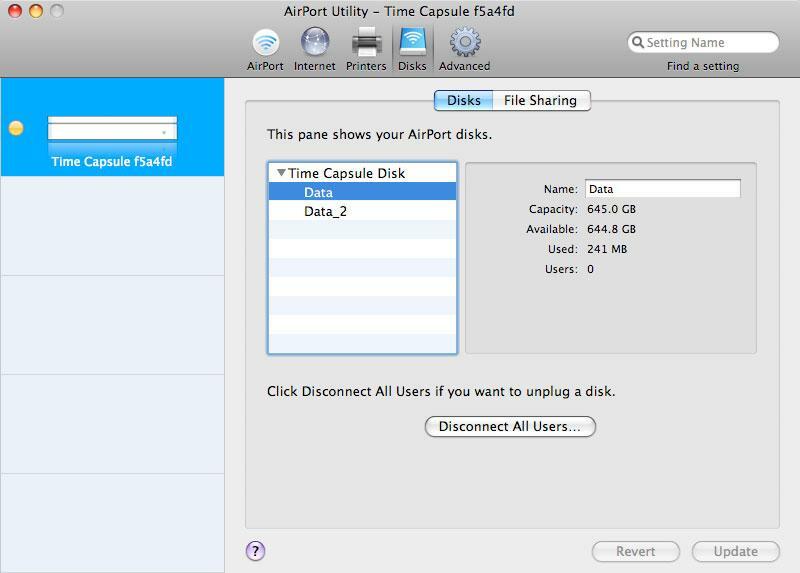 using a MacBook away from home to browse a documents folder on the Time Capsule drive?" Yes, it supports Wide Area Bonjour, the basis of Back to My Mac. However, Apple hasn't made it obvious how to connect the device to its .Mac servers in order to do this. Savvy users with access to their own DNS-SD server will be able to set this up themselves, but the rest of us will need to wait for Apple to make things more obvious. 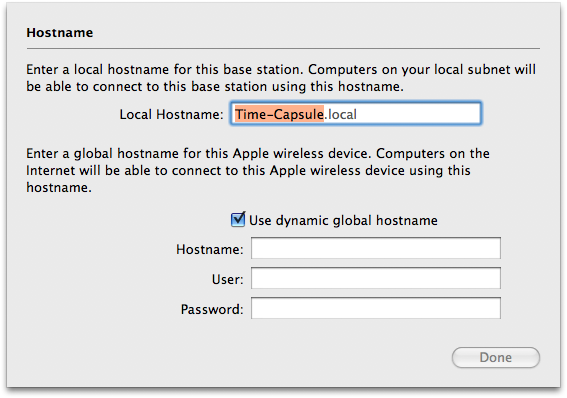 Both Leopard and Time Capsule allow users to enter a Hostname, User, and Password for a "dynamic global hostname," which means creating a Wide Area Bonjour name that can be looked up by Back to My Mac from any location. This panel (below top) is brought up by clicking Edit next to the Time Capsule Name (below bottom), or in Leopard, by clicking on Edit next to the Computer Name in System Preferences : Sharing. Password: you get this by finding the Back to Mac entry in the system keyring, and copying the password from that. On page 2 of 3: Disk Performance over the Network; Time Capsule Disk Formatting; RAID and Disk Spanning; Disk Performance; Disk vs Printer Sharing; and Upgrading or Expanding an Existing Network.